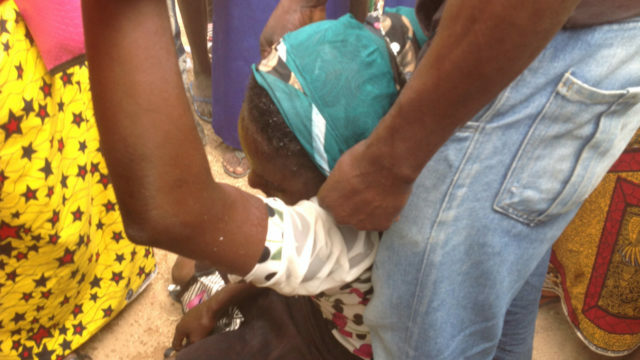 An average aged woman voter (name withheld) at Bonugo Primary School Polling Unit 004 in Kwali Area Council of Federal Capital Territory has fainted while on queue to cast her vote in Saturday’s Presidential and National Assembly elections. The News Agency of Nigeria (NAN) reports that the woman was rushed to a hospital in Kwali for medical attention. Some of the electorate who are familiar with her said the woman has been sick for quite some time. Mr Samuel Adamu told NAN that the woman had not been feeling well, saying that her faintness may be in connection with her ailment. Meanwhile, a large number of voters were seen on queue in various polling units visited as at 2.15 p.m.
NAN also observed that many of the voters defied the scorching sun to exercise their civic duty. Most of the electorate were seen sitting under trees while others came with umbrella as they waited patiently for their turn to be accredited for voting their choice candidates.